Thanks for coming to the photoshoot! Thanks to all who were involved in the cycling in Lambeth Cyclists photoshoot on a wet Sunday at the end of November – we were able to take lots of photos that will be very useful for publicity material and to illustrate campaigns. We will be arranging another photoshoot shortly for locations in the North of the borough when hopefully it will be sunny! This Lambeth Cyclists ride went through Richmond Park via Putney, and met the Thames River Tow Path. This was followed past Hampton Court Palace and down to Weybridge. From there we picked up the River Wey Navigation Path and continued down past where the Basingstoke Canal heads off towards Woking. The full ride was about 30 miles but there were several points along the route where trains could be caught back to London such as Weybridge and Woking. The path was very flat and had a good surface, with the only hill being at Richmond. There were also plenty of nice pubs with beer gardens to rest at along the way! Those that made the whole distance caught a train back from Woking. Thanks to Jon Creighton for leading this ride. We had an exciting off-road ride on the South Downs. Beautiful views, some hilly bits, about 20-30 miles, final destination decided on the day with a pub lunch along the way! Thanks to Geraldine Mason and Ché Sutherland for leading the ride. On Thursday 12th August Tower Hamlets Wheelers organised a successful easy-paced 'after work' ride to the Ace Cafe at Stonebridge Park along the Regents and Grand Union canals, with cyclists from several other LCC groups. The Ace Cafe is one of London's original transport cafes situated on the old North Circular road and was frequented by truckers, motorcyclists, and a staging point for cycle rides out of north London. Now it is a heritage cafe for bikers and cars. 'Petrolhead' events are now held there virtually every day and every weekend, but on 12th September the cafe held an event in Brighton so we had the cafe to ourselves! This ride followed the success of the earlier one to the historical motorcycle haunt, re-tracing the route along the towpath of the Grand Union Canal. Cyclists from various LCC groups were invited along once more, and a great time was had by all! Thanks to Keith Jones from Tower Hamlets Wheelers for organising this ride. As a humorous antidote to the Dunwich Dynamo ride, Lambeth Cyclists held the 'Dulwich Dynamo'; a chance to catch up with cycling friends and make new ones without having to sit on a saddle for 12 hours in the dark. We met at Olley's for probably the best fish and chips in London at 7pm (67-69 Norwood Road SE24) and ate them in Brockwell Park. Then we sampled the local taverns: the Prince Regent, the Rosendale, and the Dulwich Wood House pubs. A couple of guests from Greenwich Cyclists came along for the ride. A quiet evening pleasantly spent! Thanks to Janet Paske for the idea and leading the ride! This was a short ride to Dulwich Park on a beautiful Sunday morning to try out some of the weird and wonderful bikes on offer from London Recumbents. 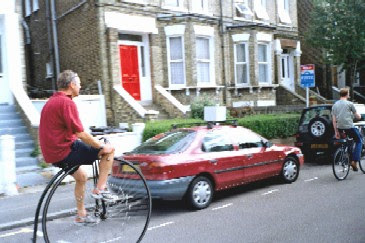 We met at Clapham Common for a coffee first, and it was lucky we left a little late as a couple turned up with a Pennyfarthing, perfect for a 'try a bike' ride! Eight of us met for the ride, including people who were involved with the Cycling for Women project and Tower Hamlets Wheelers. The ride meandered through Brockwell Park and ended up at London Recumbents in Dulwich Park where we chose bikes to try out. These included a number of 2 and 3 wheeled recumbents, a tandem, and a 'Giant' semi-recumbent - easily the most comfortable and laid-back bike there! 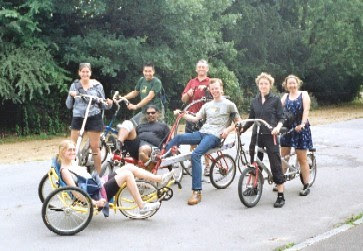 Everyone had their favourite, I particularly liked the recumbent trikes. It was great to try something you thought you could never ride and then find yourself flying around the park with great abandon! We also got to try the Pennyfarthing. A couple were successful and a few were pony-led. We ended up at the cafe for lunch and then went our own ways. Thanks to Ché Sutherland for leading this ride. This was a women's networks ride in partnership with the WDS Cycling for Women project. Despite early brief showers we had a lovely sunny day for a visit to the Barnes Wetland Centre. A small contingent from Southwark Cyclists met us for a very pleasant trip up the river, crossing Albert Bridge for a fascinating route on the north side of the river until Putney Bridge. The Wetland Centre was interesting. My first time there, but others in the group who had been there before still enjoyed it. As well as ducks, we saw a couple of great crested grebes (I think!) and lots of ducklings and moorhen and coot chicks which were suitably 'ooh-ed' and 'ahh-ed' over... plus the Centre has excellent cycle parking, unlike any I have seen before! Being seven in the group made for a perfect size to socialise, and we had two new faces. A nice day out had by all, and with a wonderful tail wind we were home in time for tea! -- Ché. Thanks to Ché Sutherland for leading the ride. This was a women's networks ride in partnership with the WDS Cycling for Women project.